The newest addition to the growing JC|P Motion archive launches today. We are proud to present "Let's Go Fly" a collaborative piece brought about by the efforts of a great crew and talented post production team. As we've moved forward into video since the launch of HDDSLR cameras it became obvious very quickly that the most important and essential element to pull together any type of motion based project is seeking and building relationships with those in the film + video industry. We would like to call out a few individuals that really helped shape and mold the piece from beginning to end into the final piece here on the blog. Adam Duguay, of Elemental Motion Media, worked with us to finesse the finer points all through the editing process. He has implemented a cutting edge technique to help bring the grading as close as possible to the color corrected stills I initially provided as a guide. In addition to all of the editing, Adam has also brought my logo to life in a new animated form which is featured in this piece and will be present in all video projects going forward. Katie Kirk and Nathan Strandberg of Eight Hour Day have been with me since the beginning working their design magic to elevate everything they touch to an amazing end aesthetic. Credit for the custom opening illustration goes to Katie and her sensibilities regarding the piece as a whole. She has helped guide us in a different direction graphically from our past motion designs, which has been a welcome change and will certainly influence our approach to the next project. Thank you both for your contribution to the piece. "Let's Go Fly" is the third collaboration with Alex Horner who worked with us on filming "Un Jour Dans La Vie d'un Coureur" and "Bright Lights: Metal In The City." Alex has always brought a great sense of technical and visual insight to all our projects, and we have enjoyed seeing the various perspectives he provides as our second camera operator. This piece is the first to have audio captured on location while we were filming and allowed us to bring in Patrick Schaefer. Patrick did a great job and helped educate us on the importance of slating a scene to make sure the audio is synced with the video when it comes time for the editing process. When you hear the birds chirping think of Patrick with boom in hand, mixers set and the record button on. Without further ado..."Let's Go Fly"
Our good friends at nFusion out of Austin, TX brought us on once again this year to continue to build as well as update the image library for Zimmer Spine that we started in 2009. This year we spent two days shooting in Minneapolis at a local hospital as well as Zimmer's recently remodeled HQ. We've had great success in the recent past, securing a local hospital for a few projects and suggested to nFusion that this facility be used as the main location for the first day of shooting and production with Zimmer Spine. 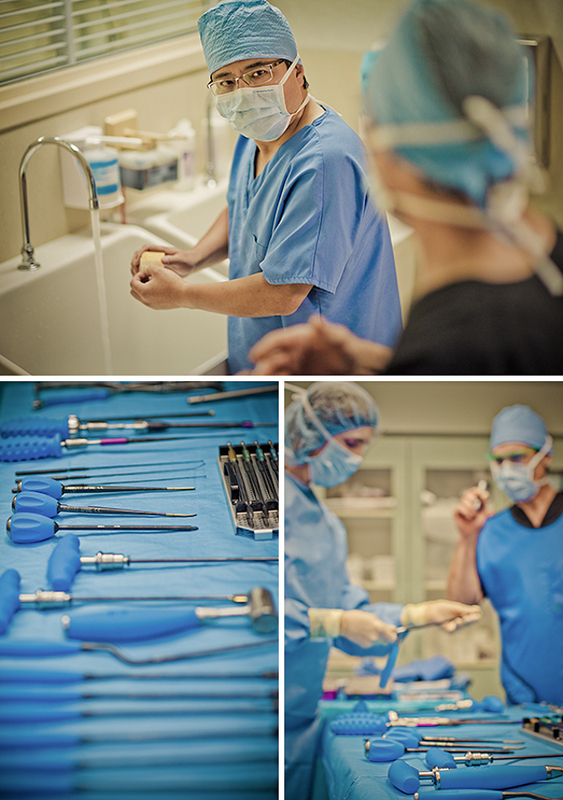 Having access to a real operating room helped our talent to ease into the roles of portraying a surgical team working alongside a Zimmer Spine representative. With an optimal environment such as this, it made it much easier to achieve a realistic look as well as increase and take the overall production value to a higher level than they were used to. Our second day of shooting was spent at the Zimmer Spine headquarters in Bloomington, MN where various doctor / patient / Zimmer Spine Specialist scenarios shaped up nicely throughout the day. From conference room seminars with reps and surgeons, to a hands on practical experience in an on-site operating room, we had amazing surroundings for every scenario with each shot layered in realism and contemporary architecture. As always a big thank you goes out to producer Bobbi Peacock and all the crew and talent who helped pull together two fruitful days of shooting in a variety of locations. Another year of sharpening skates and taping up hockey sticks has come to a close at the 2010 Bauer Athlete Camp where travels took us once again on the road for Bauer via Olson Advertising. Encompassing two days of shooting in Atlantic City, our time was divided between the ice rink and an elaborate indoor setup at a local hotel. Day one took place at a local NHL practice rink not far from the legendary boardwalk city. The ice arena became the playground for a series of individual skill tests and scrimmages between all the participating players and we had the privilege of better than front row seats to a great exhibition of what goes into being a pro and taking to the frozen stage in the NHL. The second day involved a large sheet of plexi-glass and nine pro players in full gear, but that's all I'll disclose just yet. This will be the subject of a near future blog post w/ a sweet "stop-action" video that unveils a behind the scenes look at how the most interesting part of the shoot came together. Although I'm not an avid follower of hockey, I always come away with a new found appreciation for the masters of blade and stick after spending a few days on their side of the frozen hallowed ground they know so well. A recent evening with my son Wesley, up north, at the lake. Our fourth year together on this trip to a cabin just outside of Ely, MN. Just Wes and I and some time away at a favorite place.